There was tubewalking yesterday. Look, photos, but not many as it wasn't one of the most photogenic walks ever. 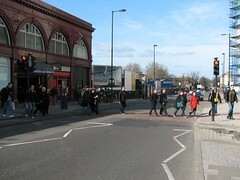 Here are some tubewalkers recreating the cover of The Beatles' famous "Caledonian Road" album. I can't find my guitar tuner. This is upsetting as my guitar currently sounds rubbish and I'm no good at tuning it by ear. Does anyone want to come round and tune it for me? EDIT: offensive_mango rocks. I now know the livejournal names of over half the people in that photo. This both terrifies and strangely excites me.